This is the most feared widow there is and with good reason. Its venom is extremely strong. While most widows have a shiny or glossy appearance this particular widow will appear more dusky as its shine will be like wax paper. These spiders can grow quite large and make messy webs. 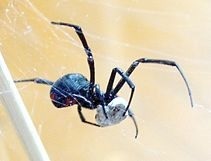 It is commonly called the Southern black widow or just widow and is the most venomous widow spider there is and even with anti-venom there is still a 5% mortality rate. Its scientific name is latrodectus mactans. It can be found in the United State, Hawaii, and the Southern parts of Canada. Before the introduction of anti-venom a bite from this spider had a 30% mortality rate. The LD50 of this spiders venom is only .002 mg/kg making it 25 times stronger than that of a black mamba. Luckily, this spider is shy and non aggressive and only delivers small amounts of venom otherwise there would be far more deaths.